So, you’re celebrating seven wonderful years of marriage. Only three years away from the big 1 0, this year may not sound like the magnificent milestone it actually is. Every year you make your marriage work is a year worth celebrating, especially one as “lucky” as number seven. While you focus on planning the perfect date night, we’ve taken the guesswork out of finding the best gift for your partner. The traditional gift to commemorate the seventh anniversary is wool or copper. Both strong, long lasting materials that only get better with age, we’ve rounded up some great ideas if you want to keep things traditional—or go for the more modern spin, where desk sets serve as the gift of choice. Here, we round up some of our favorites on both ends of the spectrum to surprise your partner with this year. What better excuse to refresh that cookware set from your registry than celebrating your seventh year with copper? Copper is a wonderful conductor of heat, allowing the pot to warm up slowly and distribute the temperature evenly throughout the surface. It’s also one of the best materials for controlling that temperature. Now that we’ve convinced you to buy your husband or wife a copper cookware set, here’s our favorite choice. The Cuisinart 8-piece set is made of triple stainless steel construction for optimal heat retention. The set comes with an 8" skillet, 10" skillet, a saucepan and cover, a sauté pan with a cover and a heavy-duty stockpot (you guessed it—with a cover). Each piece can withstand oven temperatures up to 500 degrees Fahrenheit and is constructed with stay-cool handles. At just under $300, this set is made to last, but also includes a lifetime manufacturer's warranty to protect against any defects. 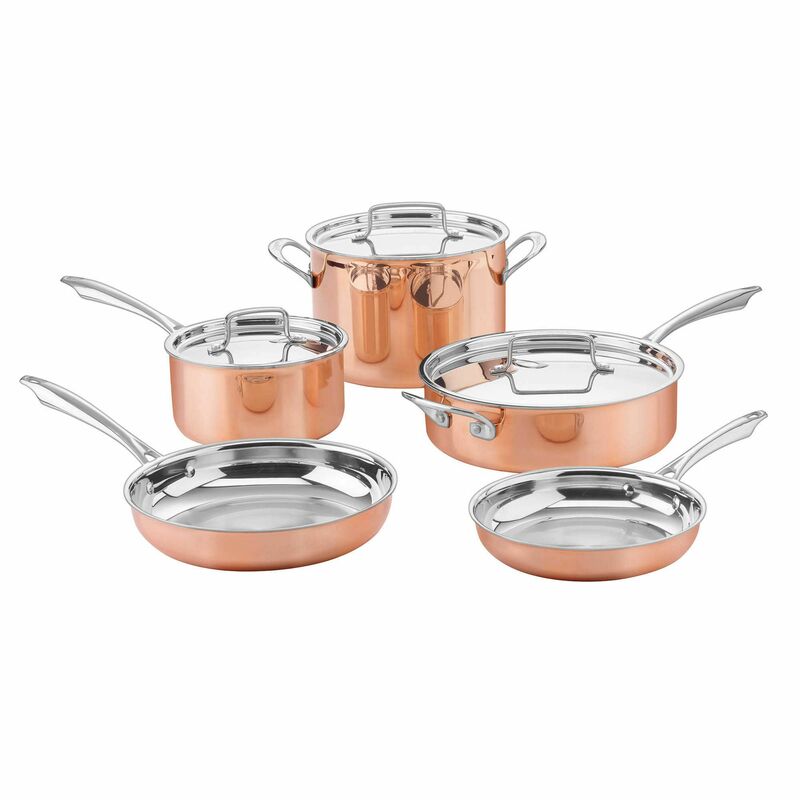 Give your loved one this copper cookware set (and be sure to cook her favorite dinner on your anniversary). If a whole cookware set is out of reach, a beautiful set of Moscow Mule mugs is the perfect accessory for any bar and a great gift for every cocktail aficionado. The Urban Vintage LA set comes with four gorgeous hammered mugs and a copper shot glass. If you and your spouse find it hard to escape for a date night these days, building a home bar is a great way to encourage you both to take a few hours for yourselves after the kids go to bed. Copper mugs keep your drink cold (even if you’re not sipping a delicious Moscow Mule) and make every drink your mixologist honey whips up look just a little fancier. Reviewers love this set, raving about its overall quality and durability. Pair it with a bottle of his or her favorite liquor for a gift you’ll both enjoy year round. Now that you’ve been together for seven years, it’s time to sprinkle in a little more romance and keep things fresh. If you want a traditional gift that speaks to her heart (quite literally), a personalized copper bracelet is a perfect choice. Copper is a popular material for jewelry because it’s easy to work with and has an unmistakable vintage look. This simple 65mm bangle can be stamped with a phrase of your choice, either on the inside (with a special message just for her) or outside. The bangle is wire brushed and comes oxidized with patina. Though it’s common for copper to change colors as it ages, it’s easy to polish to keep it looking new and fresh. Engrave your vows, a poem she loves or a message you want her to remember each day for a seventh-anniversary gift sure to wow. Your seventh year should be all about celebrating the little things and finding joy in every moment. Help her appreciate those cozy Sunday mornings wrapped up with a family with a Pendleton throw they’ll never want to put down. Forget what you think you know about wool—this blanket is soft, incredibly warm and super stylish tossed on an armrest or rolled in a linen basket. The throw is made from 100% Eco-Wise wool and measures 54" x 60", the perfect size for cuddling by the fire. It comes in four classic colors, but we’re partial to the blue sage. Brooklinen also offers a 60-day trial on all of their products, so if your spouse doesn’t wake up toasty and warm, you can return it, no questions asked. Your seventh-anniversary is a great excuse to splurge on a well-made wool blanket—pair it with an expertly planned picnic, and you’ll win major brownie points this year. Need some more help finding what you're looking for? Read through our best throw blankets article. Okay, we know socks don’t sound like an exciting gift, but bear with us. One touch of these warm and incredibly soft Red Wing Men's Arctic Wool Socks, and you’ll wonder how your husband ever lived without them. If you and your spouse are more “experience gift” people, a small but meaningful gift is the way to go this year. Made from 100% wool, these socks are crafted to keep him warm all winter long. The classic beige and gray style is subtle and classic enough that you know they’ll look great even as trends come and go. Whether you pair these wool socks with a weekend ski adventure or a new pair of boots, he’ll thank you next time he takes the kids sledding and comes home warmed to his toes. This is the perfect gift for your techie spouse who could use a little help keeping all those cords straight. Great for a home desk or at the office, the MobileVision Bamboo Charging Station is a must-have for anyone with more than one smart device. The clean bamboo looks great on every desk and comes with five compartments for tablets, phones and more. It also includes a five-port USB charger, so tangled cords will be a thing of the past. We spend so much time at our desks, whether at home or at work, and an accessory that is both beautiful and functional is a terrific way to surprise him this year. For a bigger gift, pair the bamboo charging station with that iPhone he’s been coveting, and you’ll be off the hook at least until your 10th year. Another modern gift that looks great on a desk and at home is the Echo Show. Amazon’s first visual smart home system, the Echo Show does everything that Alexa does—and more. Ask her for a news briefing, and you’ll see video coverage from your favorite outlets. Ask her to check your nursery cam and you can make sure the baby is okay without leaving your desk. It can display recipes, photos and much more without your ever lifting a finger. Alexa is compatible with iOS, Android and Fire, and easily connects to your other smart home devices. A great gift for your busy spouse, the Echo Show is the perfect excuse to splurge for your seventh anniversary. Reviewers love the visual element and remark that it’s oh-so-worth it, even if your home already has one smart home device. If you’re not feeling the traditional or modern gifts this year, give your spouse the gift of a better morning every single day. The Nespresso Inissia will give your spouse coffee shop-level brew from the comfort of your own kitchen. With the press of a button, the 25-ounce water tank instantly heats up and provides enough espresso for nine servings. If you’re still using that old coffee maker from your dating years, it’s time to upgrade. The Nespresso is the perfect gadget for caffeine addicts who crave a higher quality coffee at home, without all the legwork involved in a pour-over cup. The espresso machine includes a welcome set of 16 Nespresso capsules, so your loved one can test and try a wide variety of flavors. Owners adore the DeLonghi Nespresso Inissia, saying it’s the perfect choice for coffee snobs and casual drinkers alike. If your husband or wife isn’t quite a morning person, this is a gift that will make getting to your 10th anniversary just a little easier. Want to take a look at some other options? See our guide to the best espresso machines.